Winter is a beautiful time to have a wedding. The beautiful snow, the crisp winter air, the deep blue sky, all seem to work together to make your day truly perfect. 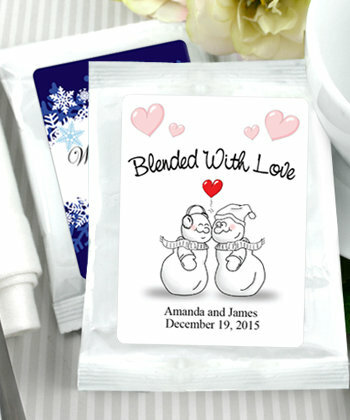 Embrace this wonderful time of year with the winter themed personalized coffee wedding favors. From elegant snowflakes and enchanting pines to fun-loving snowman and cute mittens, these unique wedding favors come in 6 winter designs that are sure to match your décor perfectly. Your guests will love the delicious premium coffee taste. Each bag of 1.75 ounces makes from 8 to 10 cups of coffee. You can have your wedding date and names printed on the winter themed personalized coffee wedding favors, plus the production time is only 2 to 6 business days.